It was especially poignant to read this book because it is all about grief and loss. Clem's house has burned down, and she's lost everything, including her mother. At the beginning of the book, Clem is awash in a sea of sadness, rage and grief and her whole world has been brutally flipped upside down. However, as the novel progresses, Clem begins to make connections -- most importantly with her new neighbour, Maggie, and a girl at her new school, Ellie, who is facing the loss of her own mother -- and she also realises that not everything from her old life has gone forever. Weetman structures this story so cleverly that the final twist took me by surprise. 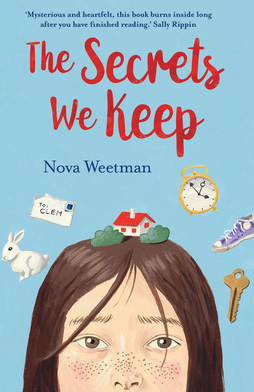 The Secrets We Keep is a special book, and not just because of the cover.